As a Master Hair Colorist I always get question upon question about how to keep hair color looking fresh for as long as possible. The answer is simple: You have to keep your hair healthy! At this point you’re probably wondering, “Renee, I know that healthy hair is key- you’ve pointed that out about a hundred times- what am I supposed to do to keep my hair healthy?” Well, my dears, there are many answers to this question, but the most important one (which is also the topic of today’s blog) is to minimize your use of hot tools such as blow dryers, curling irons, and the worst of them all, flat irons. If you can’t discontinue using them, then make absolute sure that you are using high-quality hot tools, this is definitely not the area where you want to economize. High-quality hot tools are not only better for your hair, but they will also last a lot longer than their cheap counterparts. 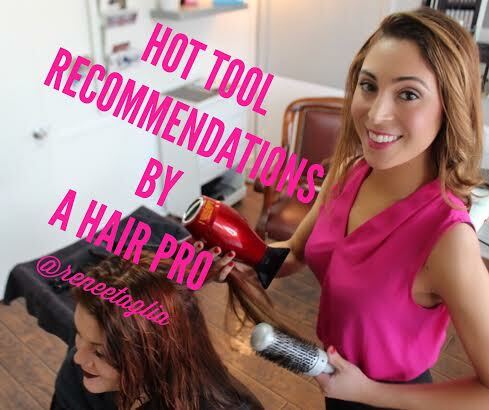 I am very picky about the hot tools that I use when I am styling my hair or my clients hair and, after trying many different tools, I have developed a list of go-to’s that I can assure you will not damage your hair. For a blowdryer, my absolute favorite brand is Taiff, the only blowdryer on the market tested for true ionic power. It utilizes both negative ions (neutralizes static electricity and closes hair cuticle making your hair soft and shiny) and positive ions (naturally opens hair cuticle to enhance and absorb the benefits from your hair treatment). Taiff blowdryer is a true game-changer! Bonus Tip: When you are blowdrying your hair make sure that you are pointing the air flow in the direction your hair grows in order to prevent unwanted frizz. My favorite brand for a flat-iron is Ergo because not only is it a truly exceptional hot tool, it also reduces the severe breakage that is common with other flat irons. Ergo flat irons don’t pull your hair which causes it to break at the mid-shaft making your hair dull and weak. Last, but certainly not least, my curling iron of choice is the Hot Tools CeramicTI Tourmaline Curling Iron. This amazing curling iron helps seal the hair cuticle and protects the integrity of the hair and it give you breathtaking curls. Bonus Tip: Do not, under any condition, put hair spray on your hair prior to curling it as it causes serious breakage. Curl each strand and let it cool before you even think about setting it with hair spray. Do you have any hot tools that you swear by and think I should give them a try? Leave your recommendations and questions in the comments!